HTPC stands for 'home theatre personal computer' or 'home theatre pc', sometimes called a Media PC or Media Center. Essentially it is a PC with a software application that supports video, photo, music playback, and sometimes video recording functionality. It enables DVD movie playback with high quality, giving people a brand new visual experience. Do you have quite a large collection of DVDs that you want to play on your home theatre computer? If so, firstly, you should rip your DVD movie to HTPC compatible format. Here I recommend MPEG 2 as the output format for DVD playback on HTPC with multiple videos, audios. MacX DVD Ripper Pro is specialized in ripping DVD to MPEG 2 for playback on HTPC with all videos/audios. With it, you can easily finish the task of DVD to MPEG 2 conversion with orginal quality unchanged thanks to High Quality Engine. Apart from ripping DVD to the media center readable format MPEG2, it can also convert DVD to MP4, MOV, AVI, H.264, or iPhone, iPad, Apple TV, Samsung, HTC One M10/9, Xbox, PS4, Chromecast, and USB supported videos with the best DVD ripper for Mac. Now let's have a look at how simple it is. Just follow this DVD to MPEG 2 guide, which will teach you how to rip DVD to MPEG 2. This DVD ripper offers superb fast conversion speed to save your time and enables you to keep your video quality. 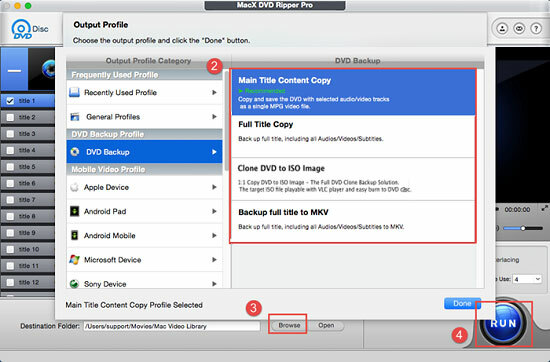 After free download MacX DVD Ripper Pro, click "DVD Disc" button to import the DVD files after you insert the DVD. Select the output video you desire. Here we choose "DVD Backup". After finish the above steps, click the "Start" button to start conversion, you the best DVD ripper for Mac allows you to view the conversion progress and are able to cancel the converting process at anytime. Note: MacX DVD Ripper Pro works perfectly on Mac OS X, including El Capitan/macOS Sierra. For Windows user, you can free download windows version here MacX DVD Ripper Pro for Windows (Window 10 also incl.) You can also play DVD movies on iPhone iPad etc. just sync the digital movie file from DVD to mobile devices with the help of MacX MediaTrans, a great iTunes alternative which can transfer video media files quickly in a click. Notice: We only advocates using this best DVD ripper to rip DVD to HTPC under the concept of Fair Use and does not encourage any illegal reproduction or distribution of copyrighted content. Please abide by the local DVD copyright law before doing it. If you looking for free movie converter for Mac to rip DVD movies and convert movie videos, hrere best free movie converter Mac (macOS Sierra/El Capitan/Yosemite) will help you convert DVDs/movie videos into MP4, MOV, MPEG, FLV or iTunes for Mac, iPhone, iPod, iPad or mobile phone. Wondering how to rip movies from DVD on Mac computer? This tutorial will give you an easy solution to decrypt DVD and get you movies off DVD onto Mac (El Capitan/macOS Sierra included) with a professional Mac movie ripper. What are the best new movies on DVD? Here is a full list of new movies releases on DVD available in all genres with release dates, casts, ratings, reviews etc. MacX DVD Ripper Pro is the best DVD ripper for you to decrypt DVD with any encryption tech (Disney DRM & Sony ARccOS) and decode DVD to various video formats (MP4, MOV, MKV, AVI, FLV, etc) and portable devices with original quality.